Back in June, our own Brian Lam did a Battlemodo between two high-res video goggles. During that review he noted "I do wish they came in 16:9 versions, but the 4:3 ratio is probably more practical." Well, Vuzix is going to put that to the test with their new AV310 goggles. They claim that it is the first video eyewear to offer a true widescreen experience—the equivalent of a 52" screen viewed from a distance of 9 feet. It also features 5 hours of battery life on a single AA as well as a typical "3D" setting. Expect the AV310 to retail for $250. Vuzix Announces iWear® AV310 Widescreen, The First-Ever Widescreen Personal Video Eyewear The iWear ® AV310 Widescreen has a 16:9 aspect ratio, providing the user with a virtual 52' home theater experience in 2D and stunning 3D video formats. 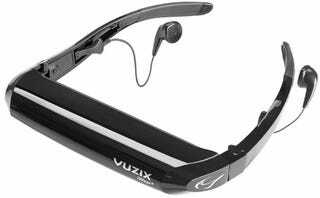 Rochester, NY – September 16, 2008 – Vuzix Corporation is thrilled to announce their latest innovation to the Video Eyewear market; iWear® AV310 Widescreen. This first-ever consumer iWear with a true widescreen 16:9 aspect ratio giving users a true home movie theater feel. The AV310 projects a virtual 52' screen from 9-feet and will run for five full hours on a single AA battery. Additionally, the AV310 offers independent focus adjustment, adjustable earbuds and nosepiece for unmatched long term comfort. Users can also expect improved compatibility, as the AV310 is compatible with all NTSC or PAL devices with a video output. Compatible devices include: • All iPod models • Portable media players • Video cameras • Cellular phones with video output • Gaming consoles • Digital cameras • DVD players "We are committed to providing our customers with the latest innovation in this exciting category and are delighted to provide the world's first and only widescreen video eyewear," said Vuzix CEO Paul Travers. "The revolutionary iWear® AV310 Widescreen is the ideal choice for the mobile consumer who's craving a way to significantly enhance their portable viewing experience," added Travers. The AV310's features include: • Virtual 52' screen viewed from 9-feet • Full 16:9 Widescreen Aspect Ratio • Independent +2 to -5 diopter focus, providing individual adjustment for each eye • Twin high-resolution LCD displays from Kopin Corporation • "Vuzix' 3D" watermark compliant • Removable and comfort fit earbuds • Adjustable, hypoallergenic nosepiece • AccuTilt™ viewer with 15 degrees of tilt adjustment • Up to 5 hours of battery life on one AA battery • On screen display settings control • For use with or without eyeglasses • MSRP $249.95 The AV310 will be available via Brookstone, SkyMall, MicroCenter, Hammacher Schlemmer and Vuzix.com.